Welsh actor Ioan Gruffudd may have one of the most confounding names to pronounce, but he’s proven his abilities as an actor from his days starring in the TV movies based on the life of sea captain Horatio Hornblower, then playing Lancelot in Jerry Bruckheimer’s King Arthur and then his most famous role, that of Reed Richards AKA Mr. Fantastic in 2005’s Fantastic Four, which he’ll reprise for the coming sequel this summer. Now, he’s starring in Michael Apted’s historic drama Amazing Grace, playing a different kind of hero in the form of William Wilberforce, the leader of the British abolition movement who made it his life’s work to try to end the slave trade in England during the early 19th Century. ComingSoon.net sat down with Gruffudd to talk about this little known British political leader who played such an important part in history, as well as find out more about Fantastic Four: Rise of the Silver Surfer, which comes out this summer. ComingSoon.net: What is it about you and alliterative names? First “Horatio Hornblower”, then “Reed Richards,” now “William Wilberforce.” Did this coincidence dawn on you when you took on this role? Ioan Gruffudd: It did actually. Yes, absolutely. I sort of insist it every time. CS: So if someone wants you to play a character whose name isn’t alliterative, your agent makes them change it? CS: How did you find out about this role? Gruffudd: I read the movie to be honest with you. I wasn’t aware of William Wilberforce or his achievements at all. I was sort of ignorant to the fact, so I read the script and fell in love with it and thought I really could do a good job with it. Then I went and pursued it by auditioning and meeting Michael Apted, sitting down and having several meetings with him, then testing for it and then the wait before I got the job. CS: Do you think Michael had seen your Horatio Hornblower movies, and knew from them that you could pull off this character? Gruffudd: I think so. I know that the period costume drama genre doesn’t terrify me at all. I love these characters, and they’re such great characters to play. I think he just gathered that from the test I had done, as much as my previous work. CS: It’s funny you mention that, because this isn’t your typical period costume drama. Most of the time they’re fairly frivolous, but this has a very serious message. 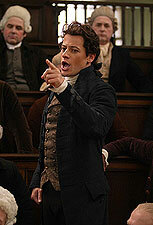 Gruffudd: Yes, I call it sort of a political thriller, really. That’s what we were determined to do, not to make it a real biopic of William Wilberforce, but to make it a real story and to show what he achieved in Parliament, sort of the intrigue, the machinations and all the workings of the British Parliament back then. CS: Did you have any idea Michael had such a great cast lined up for the movie with Albert Finney, Michael Gambon and all these other great theatrical actors? Gruffudd: Once I was on board and then I heard the people who were coming in to play these parts, I was blown away and that’s testament to the script and the story and to Michael, I think. These guys are legends in my world, and I think the fact that Michael was attached to this movie made me want to do it even more. You need a director of this sort of caliber to pull something like this off. CS: But basically, you were the first person signed on to the movie and then they cast around you? Gruffudd: You know what, I can’t remember at all. It doesn’t matter. It was so exciting that these people had come to do it. 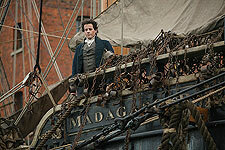 CS: And you had never heard about William Wilberforce or his achievements before reading the script? Gruffudd: No. I wasn’t aware of his history or his background or what he’d achieved. I didn’t even realize there was a difference between the abolition of the slave trade and the abolition of slavery thirty years later. This really kick-started the whole movement, ending up in the abolition of slavery in the States in the 1860s, I think it was. CS: Did you have to do any research into his life once you got the part or was it all in the script?
. How do you play a spiritual conversion? I don’t know, so I wanted how that made him feel at the time and how important it was to him. What’s great–in comparison to this day and age–is that he’s not drawing religion into his politics. It’s very personal to him, and he was an incredibly devout religious character, but he’s not using it for his political ends. He walked that very fine line between the two. CS: You obviously have a lot of experience with tall ships, so were the dock scenes as impressive doing them as it was watching them? Gruffudd: Yeah, it was like, “Here we go again.” It’s a testament to Michael’s preparation that those kind of days went swimmingly. One has to [be prepared] when working with ships. As far as the sets are concerned, all the houses that we used are still standing, they’re houses from the period. That’s the beauty of working in the UK, you don’t have to build these houses, they’re all still standing. But the Parliament was the most impressive. That was the only set we actually built. CS: Those scenes are also quite impressive for the way they were shot and all the banter between the different actors. It seems like the House of Parliaments must have been fairly chaotic. Gruffudd: It is, yes. Back in the day, it was even more chaotic than we portrayed it. People were eating in there, sleeping in there, drinking in there. I think it was good he introduced a lot of movement into it, because it’s a movie that there’s a lot of talking–it’s just people talking the whole time–so he was very keen to introduce that movement and to represent it as being a very lively place. CS: I just interviewed James McAvoy, who told me about his experiences in drama school in Glasgow, and I was curious how your experiences compared, coming from Wales. Did you go to London to get into acting? Gruffudd: Well, we have a drama college in Cardiff. It’s the Welsh College of Music and Drama and I try to follow all the drama colleges, even the ones in Scotland. I was very lucky. I was a teenage actor, really, I was a child actor. I worked on a soap opera for many years on and off from the age of 12, so I’ve been immersed in television and around actors and this world for a long time. CS: How do you go from playing these historical characters to playing Reed Richards? How did they approach you for that role? Gruffudd: No, no. Again, I just auditioned, and I was lucky to get the part. As an actor, you believe you can do anything you want and have as diverse a career as possible and here’s the chance to play a) an American icon, which I was very keen to do, to have a go at playing an American character and another leading character again. Gruffudd: You know what, it’s interesting you say that, because in fact that’s where the training really kicks in, is in a circumstance like doing “Fantastic Four.” Doing “Amazing Grace,” it’s something that you get a lot of satisfaction on a daily basis from, saying those great lines and working with these great actors back and forth. On “Fantastic Four,” it’s so technical, it’s so labor-intensive that you need so much imagination to create this in your mind’s eye. Obviously, I can’t stretch, so you’re imagining everything. You’re looking off into the middle distance and imagining I’m picking up a postbox and throwing it, to which you have to open up your mind as a child. CS: But do you have to wear some sort of green suit the whole time? Gruffudd: Well, no, there’s no real green screen work these days, there was very little in fact. We were able to use the sets in the background. CS: And they just mess around with your body using CG effects? Gruffudd: Yeah, messing around with my body, yeah, quite simply. It’s amazing what they can do these days. CS: Did you watch the first movie and think, “Hey, that’s not my body in that scene”? Gruffudd: Absolutely. Even my face sometimes. It’s incredible how they can impose one’s face onto the face of a stuntman. There’s a whole sequence in the movie where I’m fighting with Dr. Doom at the end when he captures me in the first movie, and he throws a bolt of lightning at me and I run and fall out the window. I didn’t do that moment from standing there to running and falling out the window. That was a CGI me. That’s how extraordinary it is. CS: Has a lot of time passed for the characters between the first movie and this one coming up? Gruffudd: I suppose yes. There’s two years that’s evolved in our lives as actors so I guess yes, time has passed, and we’re now established firmly as the Fantastic Four in everybody’s consciousness. We can’t walk down the street without being followed by paparazzi, so we’re really embracing the fact that these guys don’t have their anonymity. They live amongst us in New York City, and they start to question that. Do they really want to live this life and have this pressure of being super heroes or would they like to live a life of solitude out in the countryside somewhere? So they grapple with that. CS: Have the team dynamics changed at all? Gruffudd: I think I’m probably now truly the leader. He’s embraced that sort of responsibility and he’s now the leader of the gang, so everybody is looking to him for leadership and guidance. CS: Have your powers developed at all since the first movie? Gruffudd: No. I mean, he’s still the stretchy guy. What the difficulty of this movie is that every scene that the Silver Surfer is in, every frame that he’s in is an effect, so that’s an incredibly expensive and labor-intensive process. CS: Is Doug Jones actually on set wearing the costume the whole time? Gruffudd: Yes he is. Yes he does. It’s brilliant. CS: Are they trying to set things up for a possible third film? Gruffudd: I guess they probably know now how successful this one is going to be, but I hope so certainly. It’s not sort of open-ended as it was at the end of the first movie, but yeah, I’m definitely signed up for three, so I hope we do. CS: Have you seen any of the new F4 toys with your likeness on them? Gruffudd: No, not yet. I think with the last movie there was a certain toy company involved and then with this one, there is a new one. All I get are these images I have to approve. “Yeah, that looks like me,” so they can use it. CS: You haven’t been tempted to walk over to the Hasbro showroom and ask to see yourself? Gruffudd: Well, I’ve seen the old one, sure. Go over and say “Here I am, can I see myself?” No, I’m sure they’ll be incredibly elaborate and fantastic. Gruffudd: Exactly, yeah. I’m excited to see what they do with the Fantasti-Car. I’m sure those toys are going to be well sought-after this Christmas. CS: You also have “The TV Set” coming out soon, which was a movie that played at last year’s Tribeca Film Festival. When did you shoot that? Gruffudd: It was before shooting the sequel. It was done actually before “Amazing Grace.” it’s just taken it’s time to get distribution and finding the right time for it to come out. It’s coming out in April. It’s a satire or a black comedy about a writer bringing a television pilot to the network and how the network sort of butchers the original concept. I play a British executive who is brought into the network because of his experiences in the UK, and you see his demise from having a lot of integrity about the work and the writing to just getting bums on seats, and his journey to becoming one of them, as it were. CS: Do you have something else lined-up for your break before the next “Fantastic Four” movie? Gruffudd: Nothing concrete at the moment. There are a few things floating around it’s just the timing of other actors’ availability on whether these projects happen this year or not, so we’ll see. CS: Do you like to take time off in between doing each project or do you like to be working at all times? Gruffudd: There’s a certain period of time where yes, you’re glad to get your life back a little bit, because everything is sort of put on hold. I just moved into a house just before starting “Fantastic Four,” and of course now I’m starting to get furniture. My poor fiancée was having to deal with all of that while I was away. CS: Where do you live nowadays? Gruffudd: In Los Angeles. Yeah, I moved out there about four or five years ago, and I absolutely love it. Of course, it’s totally different. I love my time in London and I’m enjoying this new adventure in California. Amazing Grace opens nationwide on Friday, February 23.